The shoreline of lower Manhattan has been extended by landfill since the late 17th century, when the port activity of colonial New York was focused on the East River. 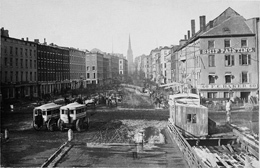 Wall Street first met the water at Pearl Street, but by 1730, the edge had already advanced to Water Street. By 1780, it extended to Front Street, then to South Street by 1800. The blocks along the waterfront were filled with businesses that served the sailing ships.� Merchants traded imported sugar, rum, molasses, lime juice, salt, ginger, cocoa, coffee, and pimento from the West Indies; the region's farms exported flour, butter, and barrels of pickled meat. Goods arriving in New York were often registered at coffee houses, including two of the city's most prominent, the Merchant's Coffee House and the Tontine Coffee House, both on Wall Street; many historians count these exchanges as the predecessors of the New York Stock Exchange. The photograph of the waterfront near Wall and South streets, c. 1860, looks west, with the steeple of Trinity Church looming large at the head of Wall Street. 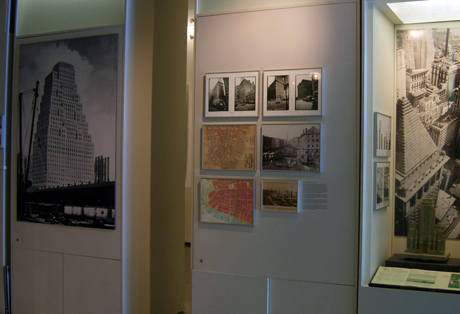 Collection of The Museum of American Finance. Tall-masted ships, sometimes referred to as "skyscrapers," crowd the shoreline in the 1890s. Reproduced from Valentine's Manual (1916). The top photograph, from the collection of The Museum of American Finance, pictures the waterfront near Wall and South streets c. 1860, looking west, with the steeple of Trinity Church looming large at the head of Wall Street. 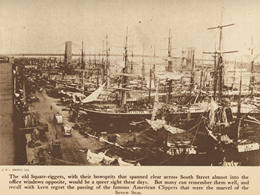 Below, the tall-masted ships, sometimes referred to as "skyscrapers," crowd the shoreline in the 1890s, in an image reproduced from Valentine's Manual(1916). The Bromley land maps reproduced here, dating from 1879 and 1891, show the waterfront bristling with long finger piers. At the foot of Wall Street in 1879 was the commuter "Ferry to Bay Ridge and Montague, Brooklyn." By 1891, the same dock contained the "West Street Ferry," which was framed by the piers for the NY and Cuba Steam Ship (SS) Co. on the north and the Clyde SS Co. on the south. 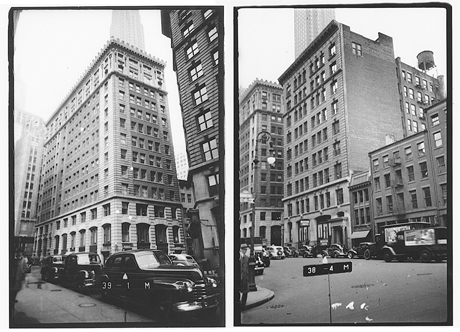 The buildings shown above-- from left to right: 82-86 Wall, known as Tontine House, 90-96 Wall, and 106 and 107 Wall-- were photographed in the 1940s as part of the City's program for appraising real property for taxation. Every address in the city was recorded by it block and lot number, as seen in the foreground. 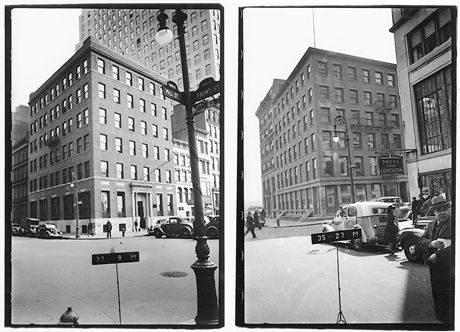 The original negatives have been conserved and copied by the NYC Municipal Archives, so new prints, like the ones here, can be viewed and reproduced.